Heat oven to 425°F. In large bowl, mix strawberries and 1/4 cup sugar; set aside. In medium bowl, stir Bisquick™ mix, milk, 3 tablespoons sugar and the butter until soft dough forms. On ungreased cookie sheet, drop dough by 6 spoonfuls. A “short” cake is one that has a high ratio of butter to flour and sugar. 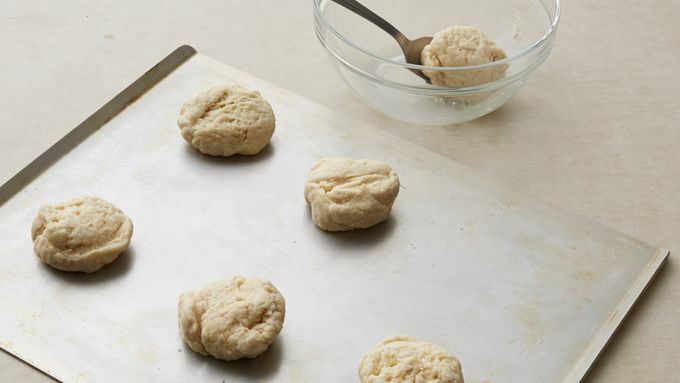 Stir the dough just until the dry ingredients are moistened and a soft dough forms. The shortcakes shouldn’t stick to the pan, but you can use baking parchment or a silicone baking mat if you’d like. 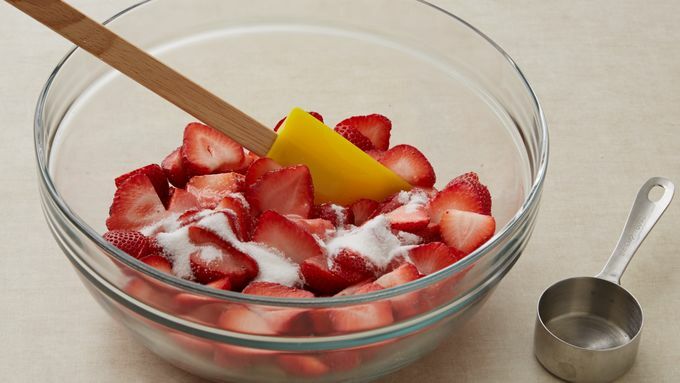 Mixing sugar with the fruit, whether you stick with all-time summery favorite strawberries or play with juicy peaches and blueberries or raspberries and plum wedges, is a process called “macerating”. Macerating is similar to marinating, but it’s done with fruit—sometimes letting the fruit sit in flavored liquors, vinegars, or syrups--or sprinkling the fruit with sugar. The sugar draws the moisture out of the fruit, creating a sweetly fruity syrup. 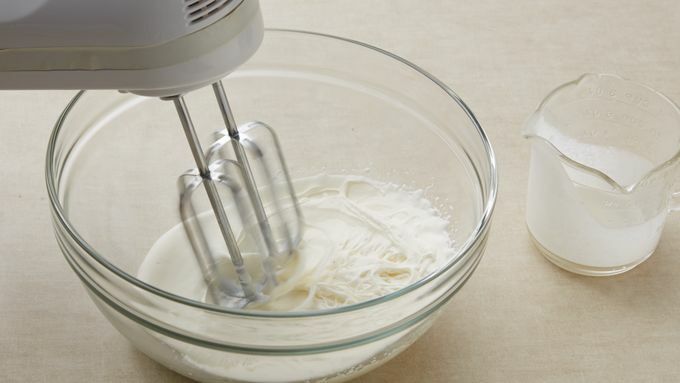 The first step in making a successful whipped cream is to refrigerate the bowl (a deep metal one works best) with the cream + the mixer beaters (unless you’re a hearty soul and would like to use a large wire balloon whisk). The colder the cream the faster it will whip up but know when to stop—when its stiff enough to form soft peaks. Flavor either the fruit or the cream with a splash of vanilla or a little orange liquor. 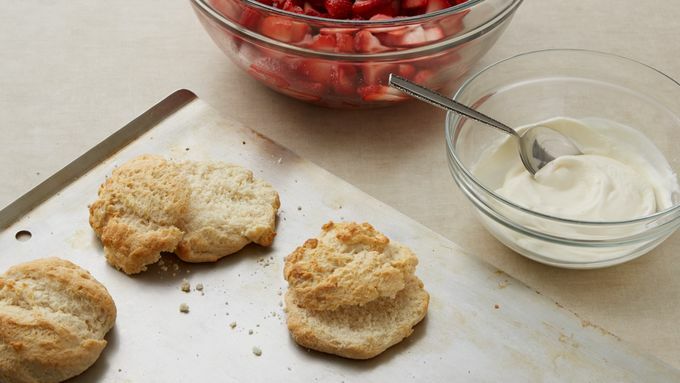 This recipe uses Bisquick™ for an easy, flaky shortcake shortcut that doesn’t skimp on taste. If you’re looking for an all-scratch recipe for a shortcake try our Strawberry Shortcake. This sweetly simple recipe perfectly captures the sweet taste of a carefree summer day. 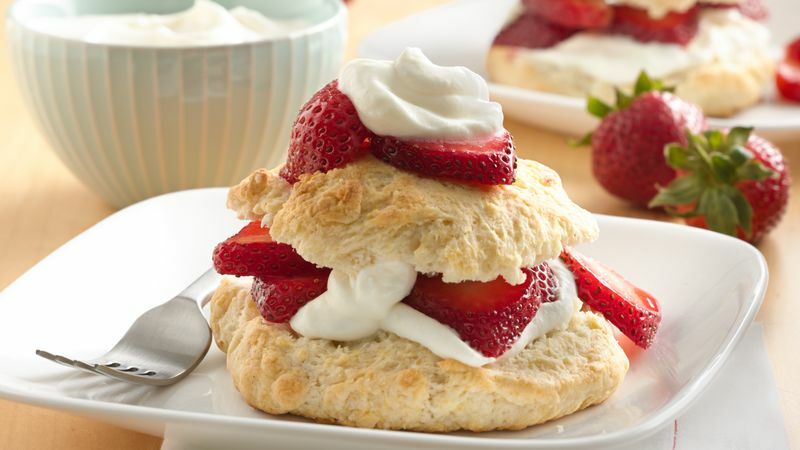 It’s loaded with fresh strawberries, topped with whipped cream and piled upon a flaky, buttery shortcake. Once you notice the first fresh strawberries of the season at your grocer or farmer’s market, you’ll know that winter is over and it’s finally time to make this memorable dessert. If you’ve never made shortcakes before, don’t worry. You can learn more by reviewing Betty’s guide on How to Make Strawberry Shortcake a collection of helpful tips, baking instructions and plenty of photos for everything you’ll need for making classic strawberry shortcakes. Once you’ve tried this Bisquick shortcake recipe, you can find traditional favorites, intriguing variations and fresh new takes on the classic dessert in this collection of Betty’s Best Biscuit and Shortcake recipes.